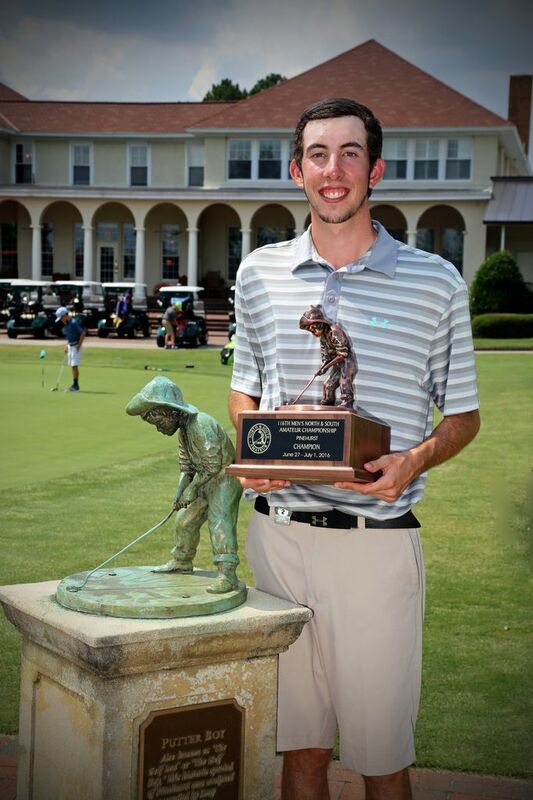 VILLAGE OF PINEHURST, N.C. – It finally got a little easier for Tim Conover. The East Carolina junior won four of the first five holes to take a commanding lead that was barely threatened to defeat Andrew Whalen 4 & 2 and capture the 116th North & South Amateur on Friday at Pinehurst No. 2. The final was a commanding performance in a week in which Conover, of nearby Holly Springs, N.C., constantly found himself of the edge of elimination. He made a testy 5-footer on 18 to close stroke play, then survived a 7-players-for-5-spots playoff to qualify for match play with the 31st seed – out of a possible 32. It didn’t get any easier from there. Faced with perhaps the most difficult draw in the championship, Conover first knocked out second-seeded Tyler McDaniel before playing a staggering 39 total holes in Thursday’s Round of 16 and quarterfinal matches. He beat Nick Hardy, perhaps the championship’s best player, with clutch birdies on the 20th and 21st holes, then went all 18 holes before outlasting N.C. State recruit Benjamin Shipp to reach the North & South’s final day. And what a day it was. Conover won the first two holes with pars when Whalen failed to get up and down. But Conover made a brilliant birdie on the 4th after a great approach from the native area right of the fairway, then followed with another birdie on the par-5 5th. Walking to the 6th tee, Conover was already in firm control of the match. Whalen got back within three holes after Conover’s only mistake of the day – a three-putt on the 7th. But Conover drained a 9-footer for par to get up and down from the left bunker on the 9th, and after Whalen 3-putted, Conover was back in front by four after the front 9. Whalen had a couple of chances to get closer. He birdied 12 to move within three holes again, and then stuck his approach shot to 4 feet on 13 to put more pressure on his opponent. But Conover coolly made his birdie putt first, and with the pressure back on Whalen, the Northwestern senior missed. Whalen stayed alive with a 25-footer for birdie on 14, but Conover again came through with his putter, making an 8-footer for par on 15 to keep his 3-up lead heading to 16. Conover finally put Whalen away with perhaps his best shot of the tournament, a dazzling approach to 6 feet on the 513-yard par-4 16th. He never had to putt it. After missing his chip left of the green, Whalen conceded the putt and the match. It was a fitting end for Conover, who had to work so hard at every moment throughout the week. The Men’s North & South Amateur Championship is the longest consecutive-running amateur golf championship in the United States. Over the past century, the best in the golf world have vied for its coveted Putter Boy trophy. The winners now serve as legends in the game – Walter Travis, Ouimet, Billy Joe Patton, Nicklaus, Curtis Strange and Love III, among others - and continues to draw the best in amateur golf circles.